Dr. Louis Papandrea attended Columbia University in New York City, where he graduated in 1977 with a Bachelor of Arts degree. He received his Medical Degree at SUNY Upstate Medical Center in Syracuse, NY in 1981. He completed his Medical Residency in 1984 at Albany Medical Center, followed by successful completion of a Fellowship in Cardiology in 1986. 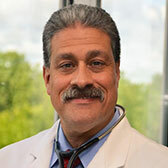 Dr. Papandrea is Board Certified in Internal Medicine and Cardiology. He is a Fellow of the American College of Cardiology and a Member of the American College of Physicians. He is on staff at St. Peter’s Hospital and Albany Medical Center. Dr. Papandrea served as Chief of Staff at St. Peter’s Hospital from 2013-2017 and remains a member fo the executive committee of the medical staff. Dr. Papandrea also serves on several quality improvement committees at St. Peter’s Hospital. Dr. Papandrea’s cardiology specialities include general cardiovascular disease, cardiovascular disease prevention, ischemic heart disease, valvular heart disease, congestive heart failure and lipid disorders. Dr. Papandrea resides with his wife Brenda in Delmar, NY. They have twin daughters, Annemarie and Lisa, as well as four grandchildren. When he is not practicing cardiology, Dr. Papandrea enjoys golf, music, and playing the guitar.